Address: Please enter your mailing address. Zip / Postal Code: Please enter your zip / postal code. The digitizing screen can now be zoomed (1x, 2x, 4x, 8x) to improve placement of the setup icons, and also provide a more detailed view of the digitized data points. The main image view can now be set to maintain the aspect ratio of the original image. This eliminates any stretching effect when the image is fit to the main digitizing screen. A graphical data shifter tool is integrated in the digitizing screen to allow selected digitized data points to be shifted up or down to better fit the graphical image. Many of the most common digitizing and graphing options can now be accessed from the toolbars located below the menus. The X data spacing can be adjusted by fitting the digitized data points using a cubic spline or linear fit. This feature can be used to set a defined number of data points. The digitizing and graphing screens now contain spreadsheets that display the (x,y) data values in real time. The maximum number of digitized (x,y) data points has been increased to 100,000 data points per file. A new digitizing speed setting allows data points to be digitized at 30,000+ points per second. The software supports additional graphic image formats, and can load larger images. It is now possible to toggle directly between the digitizing screen to the graphing screen. Context sensitive help buttons and tooltips are now located adjacent to many of the setup and digitizing options. The digitizing setup icons are larger and clearer to improve assist user interaction during the setup process. Additional screen colors, highlight colors, and data points sizes are available. The size of the data eraser and data shifter can now be customized to improve precision. The analysis screen can now be zoomed (1x, 2x, 4x, 8x) to improve placement of the lane and segment boxes, and also provide a more detailed view of the gel image. The main image view can now be set to maintain the aspect ratio of the original image. This eliminates any stretching effect when the image is fit to the main analysis screen. A distance measuring tool is integrated into the gel analysis screens, to allow x, y, and z distances to be easily measured in pixel, inches, or cm units. Many of the most common drawing and analysis options can now be accessed from the toolbars located below the menus. The Density Profile screen now contains a tool for resolving overlapping peaks. The peaks can be overlaid with Gaussian peaks shapes to allow the underlying peaks to be resolved. Context sensitive help buttons and tooltips are now located adjacent to many of the setup and analysis options. A new turbo digitizing speed setting allows the gel image to be digitized much faster. 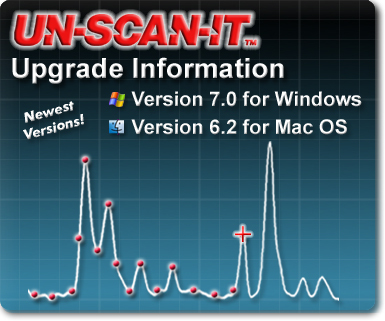 The Density Profile screen includes addition user defined settings for automatic peak finding. The Pixel Total values for all segments can be normalized to a single user defined segment. 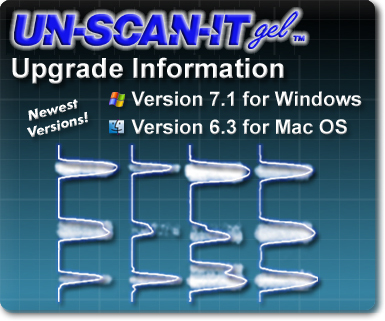 UN‑SCAN‑IT gel Version 7.1 also includes all the new graph digitizing features of the UN‑SCAN‑IT Version 7.0 Graph Digitizing Software.